I’m sure as heck not a very religious adult, but I rather admire the religious kid I used to be. I took Lent pretty darn seriously. Well, for six days a week for those six weeks, anyway. I’m not exactly sure why I thought that Sundays didn’t count. Jiminy Crickets, perhaps it was true, and the nuns told me that I could skip my sacrifices on Sunday. I don’t remember. But I do remember having more than one bleeping Hershey bar at my Babci’s on Sunday. Yes, like most kids (and perhaps half of all freakin’ adults) I usually gave up candy for Lent. I tried once getting away with giving up only hard candy (which I didn’t like much anyway), but my mother informed me that it wasn’t a sacrifice if I didn’t give up my favorite kind of candy. Which for crissakes was chocolate. I also tried once to tell her that my Lenten sacrifice was personal and private, and that I shouldn’t have to tell her. Holy mackerel. That did not go over. But Geez, there wasn’t a lot of choice for a child-friendly sacrifice. I didn’t really love much of anything else. Popcorn, maybe. But my mother made popcorn only once a week at most – and never during Lent – so that wasn’t a viable option. I loved my dolls, but heck, it didn’t seem fair to the dolls to put them in a closet for six weeks. I couldn’t give up TV. I wanted to make a gosh-darn sacrifice. Not kill myself. Besides, my parents wouldn’t have given up the TV. And not only because they loved it themselves; the flipping TV set was about the only thing that kept us kids from killing each other. And speaking of fighting: One year the nun told the class that we should do something for Lent that would have a more lasting effect than saving up the dad-gum chocolate for Easter Sunday. She told us to pick the sin that we had to confess most often, and to give up that motherlover for Lent. That maybe it would change us for good. Holy Crap, fighting with my sisters and my little brother was not only at the top of my confession list, it was about the only blasted thing on my list. (Oh, for the simpler life of a poopy nine-year-old). I didn’t steal, I didn’t covet (whatever the heck that was), I didn’t skip Mass on Sundays. I didn’t lie much – I certainly did not consider it a sin to make my stories more interesting – that’s a fricking virtue, right? So that year, I decided to give up my sibling fights for those six weeks. Let me tell you, the next year I gladly gave up darn chocolate again. Then there was the year that the nun said that instead of giving UP something, you should effing DO something. Her suggestion was to pray more. Well, shucks, I liked praying. Not so much because I thought it did a lot of good, but because I had always liked the repetition and rhythm of prayers. Sort of like meditating I guess. But golly gee, if I already LIKED it, what kind of sacrifice is it to do more of it? Like accepting a second dang Hershey bar. She also suggested making a donation to the poor. I had a winter scarf I really hated. It was crap-brown plaid. My mother made me wear it – along with a hat and mittens and boots and snow-pants and an extra sweater or two. 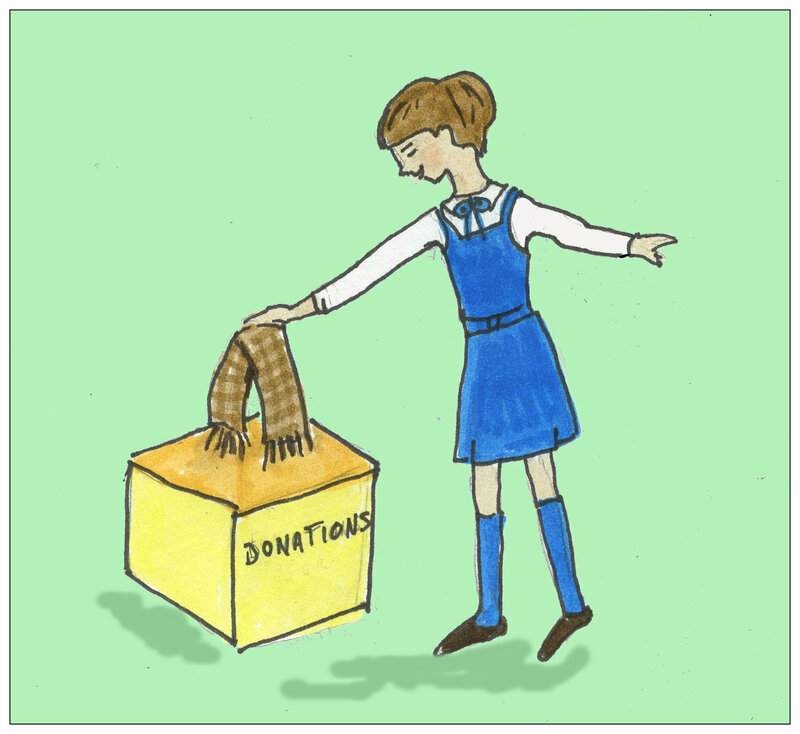 I put the crap-brown plaid scarf in the poor box (I considered adding the cussed snow-pants too). At the end of the day, the nun retrieved the scarf and called my mother, which was completely blankety-blank unfair. I’m sure some poor kid somewhere would have worn that fugly scarf. A cold, fugly boy, maybe. And even now that I am a fecking grown-up, son-of-a-gun if I don’t still like the idea of making a sacrifice during Lent. But I have already given up shopping for one whole geedee month (for monetary purposes, not Lent). And that’s one heckuva of a sacrifice, so I just didn’t know what for Pete’s sake I could choose. Then this sucky laptop got some doggone malware. Golly, I was p’d off. Jeepers Creepers! Was this a crappin’ sign? I couldn’t give up the freaking internet. No fugging way. But I found something else to give up! And I’m doing really bleeping well, don’t you think? I was reminded when all my fellow-zumbaists had smudgy foreheads on Wednesday. I usually give up all sweets at Lent, but this year I decided to go with something different. I am practicing dealing with the lumber in my own eye before mentioning the splinter in someone else’s.It may just be the hardest thing I’ve ever done! Good blankety-blank luck to you too! I couldn’t stand the friggin’ ashes. I was glad I had bangs and used them like a little whiskbroom to clean myself up. Our six-year-old this year had a discussion about what to give up for lent. Chocolate? Oh no! Candy? She shook her head. A light bulb went on. I’ll give up red meat like Mom. But you like beef… Yeah, but I can keep her company. I’d like to give up bananas. I eat one every day because I have a potassium deficiency. I hate bananas. You considered giving up bananas before Lent? Don’t to it. You hate them. but don’t do it. I’m not Catholic, and I never really understood the idea of ‘giving something up for Lent’. I do wonder why people don’t ‘give up giving stuff up’, though. Wouldn’t that work? Well slap the dog and spit in the fire! Gee-willikers! Mighty strong language there, missy. I was a bad Lenter..I don’t think I gave up anything. Now I’m too old and I’m forced to give up things for my health. Maybe I could call giving up cream cheese giving it up for Lent. And beyond. I think you are on to something. I can just pick something I’ve already given up – like donuts – and assign it to Lent. Sheesh and gee whiz -How did you guess? I gave up candy at lent because I loved it and still do. I didn’t do it to sacrifice, I did it to hoard it and run my fingers through my bounty like a miser. I played with my collection and arranged it in various types of piles, dreaming about the day i could eat it. King Midas, Silas Marner, and Uncle Scrooge McDuck had nothing on me when it came to being a miser. I didn’t go to Catholic School except for first communion lessons. I posted my experience with nuns in ‘Nun Cake’. I blog about growing up in the 50s and 60s. My mother would not let me take home my Grandmother’s Sunday Hershey bars and save them until Lent was over. I had to give them up. But I would certainly eat more than one on Sunday, before I had to leave them behind. This is hilarious. And, yes, it seems like everyone gives up sweets. I’m not Catholic and have never participated in Lent, but I’ve celebrated Mardi Gras a few times. So, maybe it’s time to give Lent a try. I know I’m a little late to get started, but I like the idea of doing something, rather than giving something up. Hmmm….. what could I do? I wouldn’t recommend you give your scarf to the poor. That went over poorly in my house. Funny stuff – I remember all this so well. Good luck with that diggidy-dog resolution. I think you’re doing swell! I went to see my family this weekend and my 12-year-old niece glumly relayed that she had given up playing her favorite Pokemon game – even locked it in a box so she wouldn’t be tempted. We were at brunch and I explained that whole “Sundays don’t count” thing. She’d never heard of it! Unfortunately, neither had her mom, my sister. This is something I only heard in recent years. As I had just gone back for a second helping of given-up-for-Lent pastries, I don’t think they believed me. I guess you didn’t give up adverbs and adjectives this year, right? Language my friend. I don’t swear, ever I simply have more colorful language. So no problem. Every year, we had the sacrifices thing and the do good thing. One year I tried to leave my brother as both the sacrifice and the do good. We were after all adopted, I thought some other family might want him more. Gosh darn! I never had to give anything up for lent as we weren’t Catholic and we didn’t have much to give up. Now I feel like I have missed out some secret society saintliness. Golly!